French Island is a National Park which is located just off the coast of Victoria. Accessible only by the French Island Ferry, French Island is an oasis of native flora and fauna perfect for a weekend of exploring. The French Island ferry gives access to the island and takes only 15 minutes to reach the island from Stony Point. It runs a service between Stony Point in the Mornington Peninsula and Cowes on Phillip Island, travelling via French Island. French Island is filled with koalas, echidnas, birds, frogs and reptiles and is a great place to learn about the history of Victorian settlement as well as take a hike or a ride down the many walking or cycling tracks. Some tours are also offered and visitors can view the Bayview Chicory Kiln or the McLeod Prison Farm. The island is undeveloped and so it is best to leave your car at home. The ferry does not carry vehicles; however there is car parking available at the Stony Point foreshore, close to the ferry terminal. The ferry departs from Stony Point Jetty on the Mornington Peninsula, Tankerton Jetty on French Island and Cowes Jetty on Phillip Island. The ferry runs 365 days a year, although may be altered during times of adverse weather or sea conditions (tide, wind, heavy rain). See the image below for the current ferry timetable. Tickets are available from the Stony Point Kiosk and note that Seniors Card Holders travel for FREE on Saturdays and Sundays. Concession tickets are available and concession entitlements include those with a Concession Card, Healthcare Card, Student Card or Seniors Card. 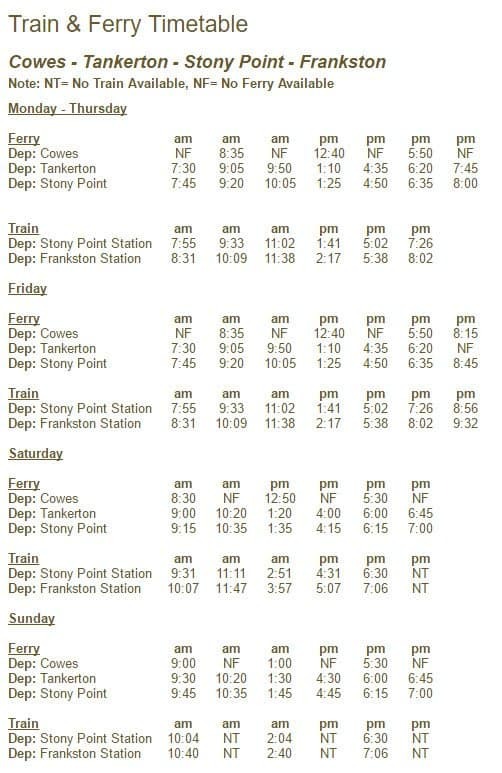 Catch public transport to any of the departure points, as V-Line has scheduled their service to match the ferry timetable. Please note that Myki cards are NOT accepted on the ferry. You do not need to book the ferry in advance, so head on down to the French Island Ferry and check out this beautiful island nature reserve. My eyesight isn’t good enough to read the ferry timetable for Sundays. 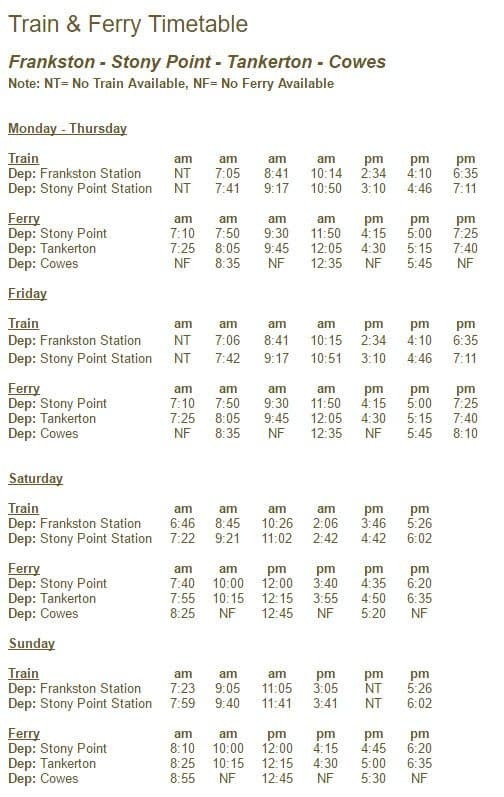 What time does it depart Stony Point after 11 am? thank you. On Sundays, the French Island Ferry leaves Stony Point at 1.45pm, 4.45pm, 6.15pm and 7pm.